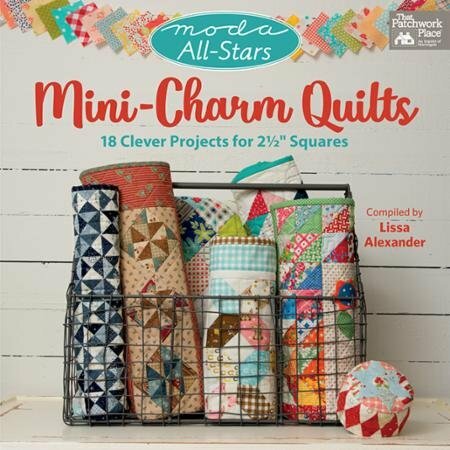 Moda All Stars Mini Charm Quilts Compilation of authors 18 Clever Projects for 2 1/2" Squares The Moda All-Stars are back with their sixth book--and it'll charm quilters in many "mini" ways! Start with one, two, or three packs of 2 1/2" mini-charm squares (they're mini, but they pack a mighty punch). Choose projects from 18 celebrated Moda designers, including Lisa Bongean, Jo Morton, Pat Sloan, Jen Kingwell, and Laurie Simpson. Then let the mini-making begin! Projects include simple squares, pretty posies, a doll-quilt-and-pillow set, and a quilt inspired by an antique game board. Also enjoy a series of lively questions that draw out each designer--it's what makes every All-Star book extra fun.